Home » FAQ » What is Variable Speed Drive used for? Squirrel cage induction motors are the most common three phase motors used in commercial & industrial applications. The preferred method of speed control for squirrel-cage induction motors is to alter the frequency of the supply voltage. Since the basis of the variable speed drive's operation is to vary the frequency to the motor in order to vary the speed, the best-suited name for the system is the Variable Speed Drive (in short VSD). However, other names used to reference this type of drive include variable frequency drive (VFD), AC drive, & frequency inverter etc. A VSD controls the speed, torque, & direction of an AC induction motor. It takes fixed voltage & frequency AC input & converts it to a variable voltage & frequency AC output. 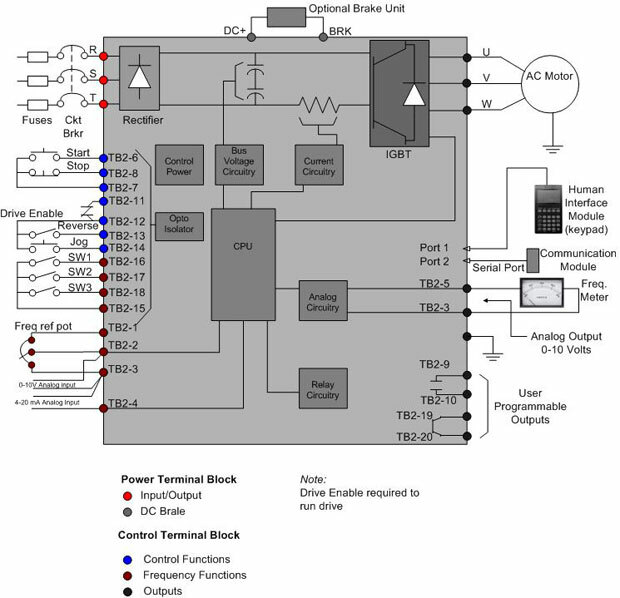 Below Fig shows the block diagram of a typical three phase variable speed drive controller. Sometimes called the front end of the variable speed drive, the converter is commonly a three-phase, full-wave bridge rectifier. However, one of the advantages of variable speed drives is being able to operate a three-phase AC motor from a single-phase AC supply. The key to this is process is the rectification of the AC input to a DC output. At this rectification point, the DC voltage has no phase characteristics; the variable speed drive is simply producing a filtered pulsating DC waveform. The variable speed drive inverts the DC waveform into three different pulse-width modulated waveform signatures that duplicate an AC three-phase waveform. ill.3 shows three-phase & single-phase converter input connections. AC input voltage levels that are different from that required to operate the motor require the converter section to raise or lower the voltage to the proper operating level of the motor. As an example, an electric motor VSD supplied with 115 V AC that must deliver 230 V AC to the motor requires a transformer capable of stepping up the input voltage. The variable speed drive offers an alternative to other forms of power conversion in areas where three-phase power is unavailable. Since it converts incoming AC power to DC, the variable speed drive really doesn't care if its source is single or three phase. Regardless of the input power, its output will always be three phase. Variable speed drive sizing, however, is a factor since it must be capable of rectifying the higher-current, single-phase source. As a rule of thumb, most manufacturers recommend doubling the normal three-phase capacity of a variable speed drive that will be operating on a single-phase input. Single-phase operation is limited to smaller-horsepower motors. Some manufacturers offer some models for single phase input only & others that are fully rated for both single-phase & three-phase input. After full-wave rectification of an AC supply into a variable speed drive, the DC output passes through a DC bus. The inductor ( L ) & capacitor ( C ) connections within the DC bus. They work together to filter out any AC component of the DC waveform. The principal energy storage element is the bus capacitors. Any ripple that is not smoothed out will show up as distortion in the motor output waveform. Most variable speed drive manufacturers provide a special terminal block for DC bus voltage measurement. With a 460-V AC input you should read an average DC bus voltage of about 650 to 680 V DC. The DC value is calculated by taking the root mean square (RMS) value of the line voltage & multiplying it by 1.414. AC voltage readings of more than 4 V AC on the bus may indicate a possible capacitor filtering problem or a problem with the diode bridge converter section. The inverter is the final output section of a variable speed drive. This is the point where the DC bus voltage is switched on & off at specific intervals. In doing so, the DC energy is changed into three channels of AC energy that an AC motor uses to operate. Today's inverters use insulated-gate bipolar transistors (IGBTs) to switch the DC bus on & off. The control logic & inverter section control the output voltage & frequency to the motor. Six switching transistors are used in the inverter section. The control logic uses a microcontroller to switch the transistors on & off at the proper time. The main objective of the variable speed drive is to vary the speed of the motor while providing the closest approximation to a sine wave for current. During steps 1 & 2, transistor switches Q1 & Q4 are closed. The voltage from phase A to B is positive. During step 3, transistor switches Q1 & Q3 are closed. The difference in voltage between phase A & phase B is zero, resulting in zero output voltage. During steps 4 & 5, transistor switches Q2 & Q3 are closed. This results in a negative voltage between phases A & B. The other steps continue in a similar manner. Output voltage is dependent on the state of the switches (open or closed), & the frequency is dependent on the speed of switching. The sine-wave (AC) line voltage, superimposed on the pulsed inverter output, or simulated AC. Notice that the pulses are the same height for each pulse. This is because the DC bus voltage the variable speed drive uses to create these pulses is constant. Output voltage is varied by changing the width & polarity of the switched pulses. Output frequency is adjusted by changing the switching cycle time. The resulting current in an inductive motor simulates a sine wave of the desired output frequency. Most true RMS-measuring multimeters are fast enough to measure the RMS value of the PWM voltage & current. There are two frequencies associated with a PWM VSD: the fundamental frequency & the carrier frequency. The fundamental frequency is the variable frequency a motor uses to vary speed. In a typical variable speed drive, the fundamental frequency will vary from a few hertz up to a few hundred hertz. The inductive reactance of an AC magnetic circuit is directly proportional to the frequency ( XL = 2 fL ). Therefore, when the frequency applied to an induction motor is reduced, the applied voltage must also be reduced to limit the current drawn by the motor at reduced frequencies. The microprocessor control adjusts the output voltage waveform to simultaneously change the voltage & frequency to maintain the constant volts/hertz ratio. The carrier frequency (also known as the switch frequency) is the frequency at which the pulses in pulse-width modulation switch at. The carrier frequency is a fixed frequency substantially higher than the fundamental frequency. This high switching speed produces the classic whine associated with variable speed drives. Higher carrier frequency allows a better approximation to the sinusoidal form of the output current. However, higher switch frequencies decrease the efficiency of the VSD because of increased heat in the power transistors. The carrier frequency for variable speed drives is in the 2- to 16-kHz range. Adjusting the carrier frequency automatically in accordance with the changing load & temperature will result in quieter operation. The inverter-duty motor is designed for optimized performance to operate in con junction with a variable speed drive. An inverter duty motor can withstand the higher voltage spikes produced by all variable speed drives & can run at very slow speeds without overheating. SCR drives are most commonly used to control DC motors, but the system is also used in some older variable speed drives. Earlier types of variable speed drives used silicon con trolled rectifiers (SCRs) to do the switching. As they have become available in higher voltage & current ratings, faster-switching transistors became the preferred switching components for use in inverter circuits. Speed control can be open loop, where no feedback of actual motor speed is used, or closed loop, where feedback is used for more accurate speed regulation. How a motor reacts is very dependent on the load conditions. An open loop variable speed drive knows nothing about load conditions; it only tells the motor what to do. If, e.g., it provides 43 Hz to the motor, & the motor spins at a speed equivalent to 40 Hz, the open loop doesn't know. With closed-loop control the controller tells the motor what to do, then checks to see if it did it, then changes its command to correct for any error. Often a tachometer is used to provide the necessary feedback in a closed-loop system. The tachometer is coupled to the motor, as illustrated in ill.9, & produces a speed feedback signal that is used by the controller. With closed-loop control, a change in load demand is compensated by a change in the power supplied to the motor, which acts to maintain a constant speed. In general, variable speed drives control motor speed by varying the frequency of the current supplying the motor. Although frequency can be varied in different ways, the two most common speed control methods in use today are volts per hertz (V/Hz) & flux vector. Volts per Hertz: variable speed drive Of the speed control methods, volts per hertz technology is the most economical & easiest to apply. The V/Hz variable speed drive controls shaft speed by varying the voltage & frequency of the signal powering the motor. Volts per hertz control in its simplest form takes a speed reference command from an external source & varies the voltage & frequency applied to the motor. By maintaining a constant V/Hz ratio, the variable speed drive can control the speed of the connected motor. Volts per hertz variable speed drives work well on applications in which the load is predictable & does not change quickly, such as fan & pump loads. voltage ratio to the frequency of a motor from 0 rpm to base speed. This is illustrated in ill.10 using a 460-V AC, 60-Hz motor as an example. The volts per hertz ratio of 7.67 is supplied to the motor at any frequency between 0 & 60 Hz. If applied frequency is reduced to 30 Hz, the shaft will slow to half its original speed. In this situation, a V/Hz variable speed drive also halves the voltage (here, to 230 V AC) in order to maintain the 7.67 V/Hz ratio, which allows the motor to continue producing its rated torque. Horsepower increases & torque remains constant up to the base speed; however, above base speed (i.e., above 60-Hz frequency), the torque decreases while the horsepower remains constant. This can easily be understood by the simple relation ship between horsepower, speed & torque: horsepower = torque × speed × K , where K is a units constant. Low-frequency voltage boost (also referred to as IR compensation)-Below 15 Hz the voltage applied to the motor is boosted to compensate for the power losses AC motors experience at low speeds & increase the starting torque capability. Steady-state slip compensation -Increases frequency on the basis of a current measurement to give better steady-state speed regulation. Stability compensation -To overcome mid-frequency instabilities evident in high-efficiency motors.